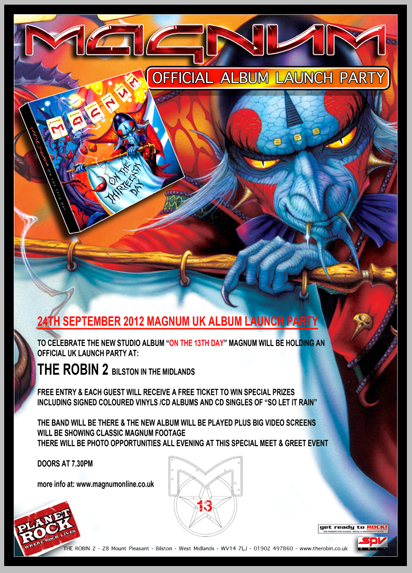 "TO CELEBRATE THEIR NEW STUDIO ALBUM “ON THE 13TH DAY”, MAGNUM WILL BE HOLDING AN OFFICIAL UK LAUNCH PARTY AT THE ROBIN 2, BILSTON IN THE MIDLANDS. ENTRY IS FREE AND EACH GUEST WILL ALSO RECEIVE A FREE TICKET TO WIN SPECIAL PRIZES INCLUDING SIGNED COLOURED VINYLS AND CD ALBUMS PLUS COPIES OF THEIR NEW SINGLE “SO LET IT RAIN”. THE BAND WILL BE THERE, THEIR NEW ALBUM WILL BE PLAYED PLUS LARGE VIDEO SCREENS WILL SHOW CLASSIC MAGNUM FOOTAGE ALL EVENING. THERE WILL BE PHOTO OPPORTUNITIES ALL EVENING AT THIS SPECIAL MEET AND GREET EVENT"
ELO Beatles Forever [ELOBF] recommend MAGNUM to those enlightened folks who enjoy the music of: ELO & Jeff Lynne, Roy Wood, Wizzard, The Move, The Idle Race, 'Brum Beat', The Beatles and related artistes. See you there?